At The Ski Clinic, we offer many machine shop services making us your one-stop PWC/ Jet Ski repair facility. If your ski is in for repair or if you bring a cylinder in for service, whatever your machine shop needs are, we can make it happen! When doing a Top-End Overhaul, if your cylinder needs a clean up hone, or needs to go oversize to clean up damaged cylinder walls, no problem. If your Cylinder is broken, cracked, or simply out of spec. 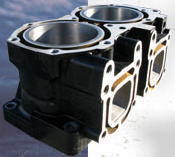 for a replacement piston, we can remove and replace the damaged sleeve, then bore to size. When performing a Top-End Overhaul, it is key to surface both the cylinder head and the cylinder top deck to ensure proper gasket/ o-ring sealing. In addition to surfacing we offer milling for those looking to gain performance with more compression. Broken bolts, damaged threads... no problem. using thread repair kits, we can get those threads better than new.